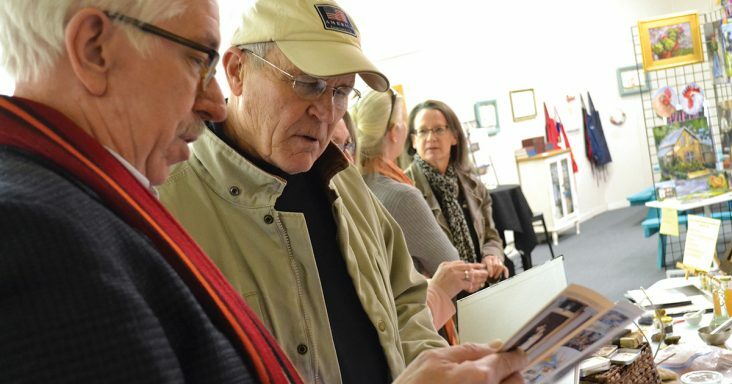 Michael Reese, left, co-owner of the Cooking Studio of Downtown Rogers, and artist Stan Dark of Elkins exchanged numbers in the hope of creating a pop-up exhibit at the restaurant featuring ‘artwork. The men met Jan. 10 at a Merchant and Artist Meetup held by Downtown Rogers Art on the Bricks. Northwest Arkansas has become a capital of retail commerce, and it is now emerging as a destination of American art. What if the two were to marry, and the region’s new identity was formed by their offspring? This is where the magic lies, some say. The Walton family has pledged to make Northwest Arkansas one of the finest places to live in the nation, a hub for artistic endeavors in America’s heartland. Their foundations created Crystal Bridges Museum of American Art, and next year the Momentary will open, a visual and performing arts space with an artist-in-residency program. An unprecedented $120 million gift to the University of Arkansas School of Art hopes to attract elite and diverse faculty and students, elevate talent and skills in the region, and through its outreach programs expose Arkansas schoolchildren to creative endeavors and opportunities. But glaring needs remain in the region. There is a dearth of art collectors and no curated commercial art galleries. The region needs affordable spaces for artists to live and work. And frankly, the artists say, people need to buy more of what they are creating. The greatest possibilities yet may lie dormant in hundreds of offices throughout the region, where some of the world’s largest corporations conduct business with Walmart. Art is heavily influencing commerce across the globe, said Dylan Turk, a consultant with KIN, an arts advisory firm in Bentonville where he pairs business clients with artists for projects. As an example, Turk cited Gucci’s collaborations with artists for mural projects, to design the patchwork on its denim, and for illustrations on accessories and ready-to-wear. Results have been wildly successful. Companies such as Facebook have artist-in-residency programs. Northwest Arkansas has, cohabitating the same neighborhood, a strong regional art climate, an influx of artists on an international scale, and a mass of retail. The key is for businesses to begin incorporating budgets specifically for art, Turk said. On a local level, Turk is working with an Arkansas bank that’s rebranding and looking to connect with the new generation by collecting and displaying art. Seeing this happen in a traditional banking environment is exciting, Turk said. Turk is also a member of Bentonville’s Public Art Advisory Committee. His matchmaking involves artists from a range of locales — from Amber Perrodin of Springdale being commissioned for a 5- by-15-foot painting in a local business space, to bringing in Portland-based artist Jessica Pezalla for a workshop and demonstration at Crystal Bridges. Much of Turk’s time is devoted to familiarizing himself with artists and their work, for which he finds Instagram essential. The region needs a comprehensive way to gather and disseminate art-related information and activities, he said, particularly after the Momentary opens and attracts its own variety of art aficionados. Local artists say one of their most glaring needs is for commercial galleries to exhibit and promote their work. Fewer than 10% of artists make a living at their craft, leaving 90% to carry multiple jobs or rely on family members, retirement funds and savings to get by, according to the Mid-America Arts Alliance, which oversees the Artists 360 program, providing grants and professional development to artists in the region with funds from the Walton Family Foundation. Studio artists need creative means to get their work before the public eye. Many use cooperative gallery spaces such as Fenix (with more than 40 members) and the nonprofit Art Ventures (more than 70 members) in Fayetteville, and sUgAR, a gallery run by UA students. Studio 300 opened in downtown Rogers in December. Retired architect Jim Mangold supplied a building, the staff is volunteer, and the gallery takes no rent or percentages. On an honor system, artists are expected to donate 30% of profits to Meals on Wheels. “There’s a long way to go, huge gaps to fill. The art world is an ecosystem, and we need all the parts for that ecosystem to grow,” said Daniel Baskin of Fayetteville, a co-owner of Feast Gallery. Baskin and his partner operate their gallery, now in its third year, within their home. Several times a year, they host up to 200 visitors for diverse shows with visiting artists that may incorporate historical objects, a dinner party, or group-led conversation. Galleries do play a key role, but they become less relevant with social media capabilities, said Guy Bell, a Little Rock-based artist who had hoped to open a gallery in Bentonville last year. Bell was recently hired to gather 100 works by regional artists for display at Martha Stewart’s Food and Wine Experience in Las Vegas. He used to own a gallery in Little Rock, Drawl Southern Contemporary Art, but now runs an art consultancy — connecting collectors with artists, helping his customers select art, and handling framing and installation. “It’s not the same overhead as a gallery. Changes in communication almost make a gallery antiquated,” he said. But “there needs to be more community involvement and people need to buy work from local artists,” he said, rather than relying on mass-manufactured décor. “Arkansas businesses have a moral obligation to support artists. I would ask interior designers and furniture companies to put local art in their businesses. I’d also like to see the legislature incentivize it; give a tax break to organizations buying local art,” he said.